Unify your business and practice information while building secure efficiency into your daily work. With Expert Sierra’s lightweight, cloud-based architecture powered by Amazon Web Services (AWS), drive down overhead cost while creating an environment that easily supports revenue growth, efficiency and mobility. 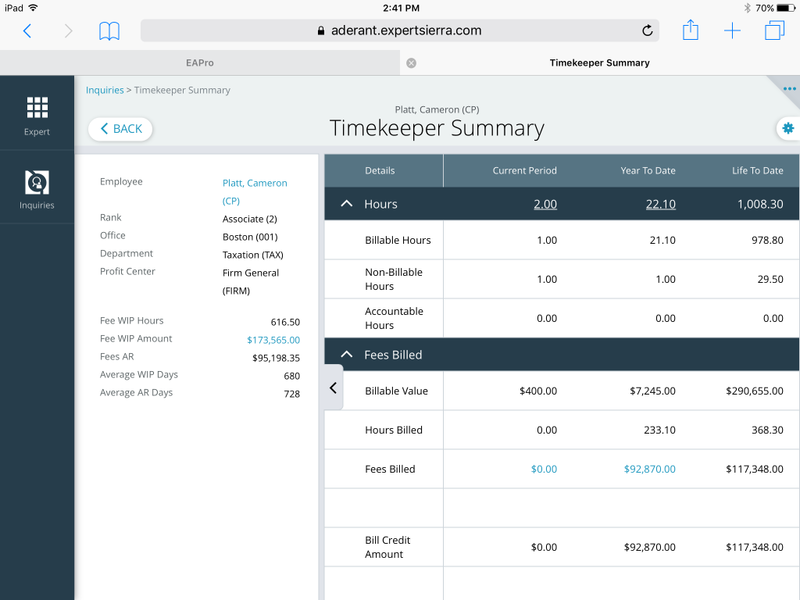 Whether you have multiple locations or just one, Aderant’s Expert Sierra is the legal practice management software that will enable mobility, agility, collaboration and automation in your firm from one single platform. Cut the cord on multiple systems. Free trapped information and centralize all your practice information-not just documents-in Expert Sierra’s integrated Case, Financial, and Document Management suite. Eliminate manual and repetitive processes that eat up your billable time and limit the quality of your legal work. Through Expert Sierra’s task flow templates, document assembly and so much more, increase productivity without sacrificing quality. Powered by Amazon Web Services (AWS)—the gold standard for cloud computing—you can remove your biggest technology concerns from your office with Expert Sierra. This cloud-based legal practice management software solution is available for a low per user monthly subscription fee and flexible hosting options including data backup and free upgrades.